I showed you my fabric cupboard a while back. That wasn't the WHOLE story. One box of little squares in little bags. These even have a little template. I have quite of few of these little buckets. sharing space with lincoln logs. Drawer FULL of whites, etc. And I DID shop yesterday. I'm OFF to make a quilt! but when I looked at the red it just wasn't right. This is how I made this quilt. tacked down with a little glue stick. Maybe plain newsprint would work better! all the way across those star points. You can see here the center of the starts all have a white strip. I know.....too many scraps at my house. I still have more! oh no! I DID have to rip off all that paper on the back! I enjoyed getting this off my to do list. And I enjoyed the process. Here's the beginning of a new quilt. The backs of those pieces. You can see how I sewed right through the paper. For those NON quilters out there. I began with 5" squares and 2 1/2" strips. Thanks to Amanda Jean for the inspiration. I bought these fat quarters a long time ago. All those "sort of" solids were in my stash. I REALLY didn't have to go to the store for this one. Then I finished the top. I DID NOT have a piece of fabric big enough for the backing! and 1 yard was NOT going to do it! I don't like doing extra work. I like finishing the quilt REAL QUICK when the top is done. than to go to the store and get a bigger piece of fabric. not making that drive to BUY some? LOOK more like a road. And today I added this to my growing collection. I wanted to experiment with flowers. I have TONS of scraps. I had a friend come over to sew yesterday. It was a very productive morning! Jen began with fabric, ribbon and elastic. This is what she got. That ribbon hem was so-o-o easy! Jen brought over some OLD patterns! I'm thinking about a house in the middle of all these. Here is a quilted puzzle. some big pieces of fabric came in the bag. Some strips came in the package. Why am I dealing with this? stash when she passed away. I wanted to finish something she started. She made a LOT of quilts. She also gave a LOT of quilts away. I was able to make some headway with it. Then I found out one of her children had not recieved one of her quilts. 25 YEARS of marriage next month! I will be very interested to see what this pattern actually looks like. remember...I just tried to fit it together as best I could. I had all the borders on when I noticed....! Let's not tell the new owners about that.. I don't need any more fabric!!! The act of folding it really, really helped! AND....I haven't been to a fabric store since. I went to a THRIFT store! A thrift store is not a fabric store. I wasn't even THINKING about fabric when I saw these curtains. They were still in the package! (excuse the sideways picture above. Well, my mind went right to QUILT. And now I can make another quilt! This is a quilt top that I have had in my cupboard for years. and this one never made the cut and never was gifted. I would Cut 6" squares and sew them together. Well, I didn't think this quilt would ever find a good home. BUT...I think this week it did! 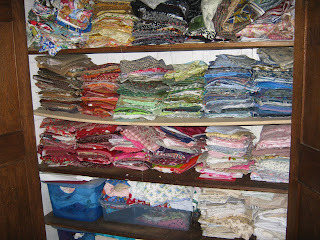 Did you know I have a few quilts? Like I said, this quilt has waited a long time. I was so happy to make a college girl happy. I have a whole bolt of muslin I need to use up. how do I look for quality in muslin?